Adobe AIR allows developers to use familiar tools such as Adobe Dreamweaver, Flash Builder, Flash Catalyst, Flash Professional, or any text editor to build their applications and easily deliver a single application installer that works across operating systems. Adobe AIR runs on Windows, Mac OS, Android, iOS, and BlackBerry Tablet OS and powers millions of browser games and over 50,000 mobile games. Notable applications built with Adobe AIR include eBay Desktop, Pandora One desktop, TweetDeck, the former Adobe Media Player, Angry Birds, and Machinarium, among other multimedia and task management applications. 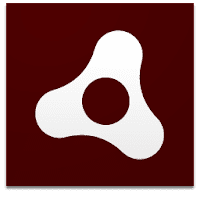 Disclaimer: Direct downloads for the lastest version of Adobe AIR 27.0.0.124 are provided by the official software's author, we can't guarantee safety, availability or download speed. Moreover, we don't and we won't provide any pirated/illegal versions or tools. We recommend you to avoid it as these methods can harm your device. If you like the software, buy it to support the developers. (We provide software discounts for many worldwide brands).